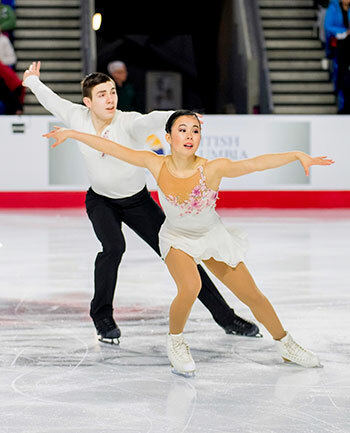 On January 5th, Lori-Ann Matte and Thierry Ferland flew to Vancouver for the 2018 Canadian Figure Skating Championships. This was their 5th Canadian Championships as a pair. After a perfect season to that date, with all the titles of the season, provincial champions, Skate Canada Challenge champions, and 2nd place Canadians last year, they were aiming for the first place for this year’s competition. The came in first in their short program on a total of 9 couples. Then, they managed to get on the highest step of the podium to collect the gold medal after their free program. “We have done our utmost to ensure that the points combined allowed us to reach our goal by winning the title of Canadian Junior Couple Champions” says Lori-Ann. 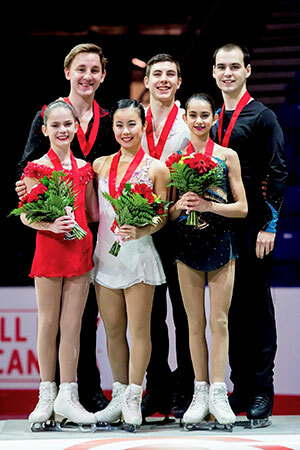 At the end of the championship, Skate Canada and Skate Quebec announced to Lori-Ann and Thierry that they had been chosen to represent Canada at the next World Junior Championships. These will take place from 5 to 11 March 2018 in Sofia, Bulgaria. We wish them success and a performance that lives up to their talent. You can follow Lori-Ann Matte & Thierry Ferland on Facebook.